Flagstaff, Arizona – The Volcanism in the American Southwest conference is different from any meeting that I’ve attended. First, most of the participants are geologists at academic institutions or government agencies, but there are also a good number of emergency managers, social scientists, aviation specialists, and meteorologists. We’ve come together to discuss the potential volcanic hazards and how best to mitigate them. 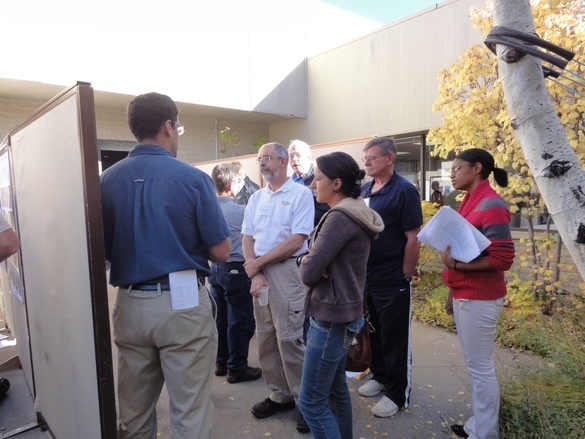 I’ve learned so much about emergency response planning and how decisions are made. Did you know that each state has an emergency response plan? If you’re a scientist and you’d like to get involved in your state’s mitigation planning, you can join your Emergency Management Association. Second, the Arizona Shakeout took place this morning during a convenient coffee break. 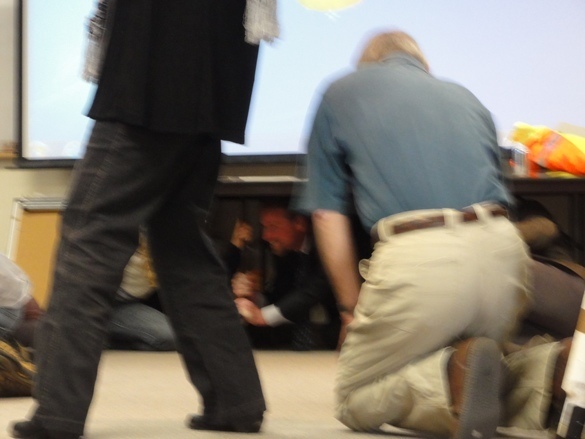 Most of us hid under tables or ducked, covered, and held at 10:18 am as we simulated an earthquake. There were even sound effects and shaking (notice the blurry photo). I can honestly say I’ve never crawled under a table with other people at a conference before. Finally, our poster session was held outside under Arizona’s blue skies. Whitney, on the far right, is learning about the Smithsonian’s Global Volcanism Program. The sun was almost too bright and too warm for an outdoor poster session, but given that it’s mid-October, I’m not complaining.